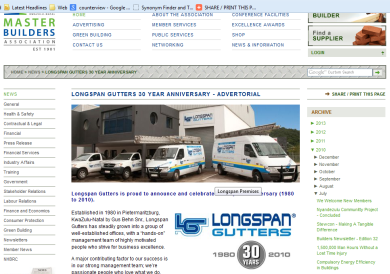 On our masterbuilders.co.za website you can place an advertorial promoting your company which will have a link that will stay on our home page for no less than seven days. If you have a more specific market you would like to target, you can place a global banner or a forum ad, on either our general forum or safety forum; collectively they have over 2000 members. Our bi-weekly email newsletter has over 3000 subscribers and if you are keen to get some very affordable advertising to a large group of people, this is definitely the way to go. To advertise in the email newsletter will cost between R700 and R2000. A back link to your website will be included, which is a nice way of driving traffic to it. In the conference centre at our Westville offices there are 3 large monitors where you can place a digital advert. A 30 second static advert on three screens displayed in an area where up to 150 or more conference delegates pass, offers huge bang for your buck. If you are interested in advertising with Master Builders KwaZulu-Natal, you are welcome to contact me on 031 266 7070 to discuss the various options. With annual shutdown well and truly behind us, it seems that most of our Members are back in operation after a well deserved rest. We trust that everybody had a great festive season and is looking forward to a prosperous year ahead. We too anticipate a big year ahead with lots of exciting new initiatives on the agenda that include the opening of a Newcastle office, as well as the launching of our Emerging Contractor Program. In addition to providing the usual bouquet of services that comprise of Health & Safety, Contractual Legal, Employee Benefits, Training and Building Services, the Association understands the need for networking and has several events planned that will take place throughout the year. As always, we endeavour to keep you informed on all that is happening so look out for your e-newsletter, and keep an eye on masterbuilders.co.za. 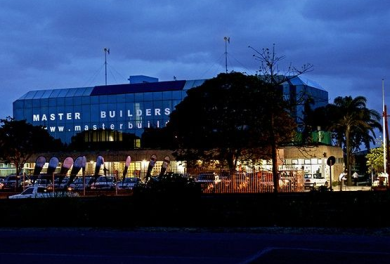 The team at Master Builders KwaZulu-Natal welcomes you back and we look forward to being of service to you throughout 2013.